You might not recognise the name Jamie Hewlett, but you might be familiar with some of his creations - or, in the case of his forays into the world of music, co-creations. On the surface, the Englishman Hewlett - hailing from Horsham, Sussex, but now dividing his time between London and Paris - is a comic book artist and designer. However, it is his dizzying range of influences and how they have manifested in his own visual style, that have really made him successful and compelling for a wide range of audiences. For many people around the world, Hewlett will always be most strongly associated with Gorillaz, the virtual four-piece band that resulted from collaboration with Blur's Damon Albarn. Hewlett was responsible for developing the characters, which included lead vocalist and keyboardist 2D, bass guitarist Murdoc Niccals, guitarist, keyboardist and background vocalist Noodle, and Russel Hobbs, who handles drums and percussion. Gorillaz have already released four studio albums since their establishment in the late 1990s, with the first three - 2001's Gorillaz, 2005's Demon Days and Plastic Beach in 2010 - having gained Gold and Platinum certifications across the globe. There has been talk of an imminent new Gorillaz album - Hewlett declaring in a recent interview that he has, "come back refreshed and excited”. But what else do you need to know about the unassuming 47-year old's continuing, and once-improbable journey to the centre of the art world? Hewlett was born on 3rd April 1968 and attended Tanbridge House School. Even as a child, he showed strong artistic credentials and he found drawing to be a relaxing activity. Coincidentally, his childhood home was located opposite an art college. It was at around this time that he contributed to artwork for a road safety campaign that ended up coming second in a national television competition. The creative shenanigans came thick and fast after that. He went on to study at Northbrook College Worthing, where with Alan Martin and Philip Bond, he created a fanzine called Atomtan. On their departure from the college in the late 1980s, Hewlett and Martin were approached by Brett Ewins to contribute material to a new magazine - Deadline - that he and Steve Dillon were setting up. Martin and Hewlett duly created the anarchic strip Tank Girl, which was based around the eponymous punk teenager, the tank that she drove - which also doubled up as her home - and her mutant kangaroo boyfriend, all initially set in a stylised post-apocalyptic Australia. 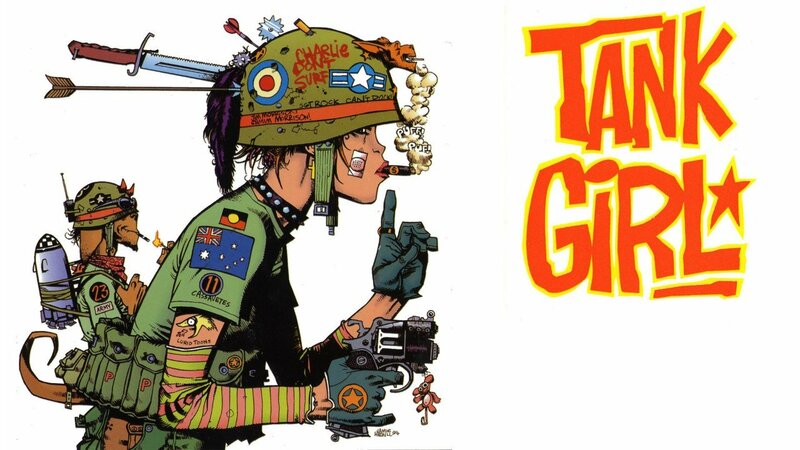 The highly disorganised, absurdist and psychedelic Tank Girl proved the perfect showcase for Hewlett's eccentric style. The strip's extremely loose commitment to any kind of conventional plot or narrative helping to make it such a hit that Penguin purchased the rights to collect the strips as a book. Tank Girl was even later turned into a film, directed by Rachel Talalay and starring Lori Petty, Naomi Watts and Ice-T. Although Hewlett had little involvement with the movie - which was a critical and commercial failure - his other exploits were a very different story. From contributing artwork to Commodore User magazine; designing decor for a Worthing nightclub called The Factory; drawing a Tank Girl mini-series for the Vertigo imprint of DC Comics and, opening a second-hand clothing store in Worthing called 49, Hewlett kept himself busy throughout the late '80s and '90s. By the early '90s, Hewlett had become a major figure in the comic world. After splitting from girlfriend Jane Oliver, Hewlett moved in with Albarn, and the idea of Gorillaz was born. This idea culminated into chart-topping, star-studded albums, and Hewlett being named the Design Museum's 'Designer of the Year' 2006. Another, more recent collaboration with Albarn was a re-working of an ancient Chinese legend, entitled Monkey: Journey to the West. Throughout his career, Hewlett has pointed to an extremely wide range of influences, from the cartoonists Carl Giles, Jack Davis and Mort Drucker, to the American satirical magazine, Mad - and the first film of the original Star Wars trilogy. Brendan McCarthy, Moebius, Tony Hart, Tanino Liberatore and Brad Bird are other creative figures to have been cited by Hewlett from time to time. What do all of these projects and influences point to? They certainly indicate to us an enormously engaged, ambitious and original artist - in other words, an entirely befitting Addicted Art Gallery 'Artist of the Week'!